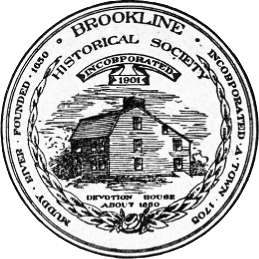 The twelfth annual meeting of the Brookline Historical Society was held in the Edward Devotion House, Brookline, on Thursday, January 23, 1913, at 8 p.m., in accordance with a notice mailed to every member. President Charles H. Stearns was in the chair. In beginning this, the twelfth annual report, I desire to give my cordial thanks to those of our members, who, in season and out of season, have aided me so much in conducting the affairs and the meetings of our Society. We have had a prosperous year, as indicated by the numbers on our membership rolls, and we have had occasion to mourn the loss of several of our most valuable and valued ones, chief among whom is our former beloved president, and at the time of his death holding the office of president emeritus. The number of members reported at our meeting in January, 1912, was 196; the number on our list today is 228, a gain of 32. Mr. Whitcomb who lived in a rather remote section of the town, was a comparatively young man and his death seemed premature. He was of the real estate firm of Whitcomb & Co., and was most highly spoken of by his associates. Mr. Doliber was the head of the Mellin's Food Co., and came to reside in Brookline about 1889. He had a beautiful home on Goddard Avenue, which before his occupancy was known as the "Raymond Place." Mr. Doliber married a daughter of Charles Henry Heath, whose father and grandfather had lived in the old house, on Heath street, now occupied by the Misses Dana. His wife wrote a most entertaining paper on the Heath family which was read before our Society. Mr. Doliber was a most kindly man, and his beaming face suggested a resemblance to one of the Cheeryble brothers of Dickens' creation. June 19, Rufus George Frederick Candage. Captain Candage was so well known here that it is not necessary for me to make an extended eulogy, but as I have said before, we must remember that we are indebted to him for the very formation of this Society; and we know with what fidelity and zeal he presided over our meetings. He was born July 8, 1826, in the town of Blue Hill, Me., on the shores of Penobscot Bay. As was natural for a boy living so near the salt water, he early went to sea, and beginning in an humble position before the mast, he was before his majority in command of one of the splendid clipper ships which before the war were the glory of New England. About the year 1868, after retiring from his sea life, he came to live in Brookline, the home of his first wife, who belonged to the Corey family; and he at once took an active part as a citizen. He had held nearly every elective office in the town, Selectman, member of the School Committee, Assessor, member of the legislature, trustee of the Public Library, and Moderator of town meetings. Though he had but a limited school education, he was a great reader, and had written many articles for the newspapers. He was a member of the Thursday Club, and had prepared and read a number of papers there; and we know of the frequency of his articles read before this Society. He was of a genial, hearty nature, and though sometimes accused of being rather domineering and hasty in his judgments, it is but fair to refer this in a large measure to his long position as a sea captain, when he had to assume a dignified and determined attitude. To those who knew him best, he was of a lovable and kindly nature, and we have with us a most affectionate remembrance of him. Although he retained his residence in Brookline, he died in the town of Stow. July 24, Roswell E. Douglass. Mr. Douglass moved to Brookline in 1907. He was a zealous member of the Methodist Episcopal Church and was much beloved. He died at his summer home in Plymouth. In the death of Miss Howe the whole town, as well as our Society, has lost a valued member. She was born in Brookline and had always lived here, except the time spent in the summer home in Little Nahant. She was a daughter of Thomas Howe, who came to live at his home on Linden place about 1850. This house and the Fay place adjoining have for more than sixty years been occupied by the same families. Miss Howe was of a most kindly nature, of great executive abilities, and charitably disposed. For twenty-seven years she had been a director of the South End Industrial School, located in Roxbury, and for twelve years its president. She attended our meetings when able so to do, and wrote an interesting paper on Rebecca Nourse and the Salem Witchcraft. She died at Nahant. In addition to the above, it is but fitting to make mention of the death of Mrs. William H. White, who though not immediately connected with our Society, used frequently to accompany her husband, who is a member, to our meetings. Mrs. White was a sister of Luther M. Merrill, and in her younger days lived in her father's house on the corner of Longwood avenue and Kent street. She was always much interested in the papers read here, and in the Edward Devotion House. She died October 22, at her home on Dean road. January 17, 1912. The president's annual address. After giving a report of the Society and its statistics, a short account of the Hinkley-Ayer house on Harvard street was given. February 21. "Washington as Seen Through the Vision of the Poet," by Rev. Lewis Wilder Hicks of Wellesley. This was an interesting paper, it being the bringing together of the various poems and verses concerning the Father of his Country, which appeared from time to time during the public life of Washington, mostly of a highly complimentary nature, but some denunciatory, especially those written at the time when he was so severely criticised during the dark days of the Revolution. Some of the poems quoted were of considerable literary merit. March 21. "Farm Life One Hundred Years Ago," by Mrs. Charles K. Bolton. Your president was confined to his home at this time, and cannot speak of this paper from actual knowledge. It was spoken of very highly. Our vice-president presided at the meeting. April 18. 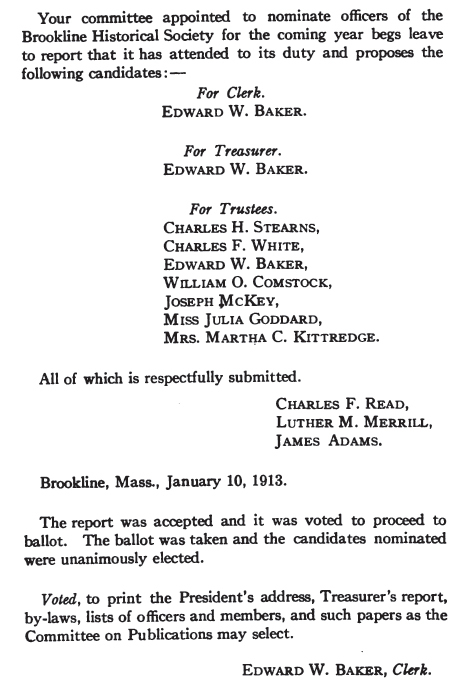 "Original Manuscripts and Documents Preserved in the Clerk's Office of the Town of Brookline." This was an exceedingly interesting meeting, and the papers and extracts from the old documents, discriminately selected and read, interspersed by original explanations and remarks by the reader, were highly appreciated by his hearers. The Society and the town are greatly indebted to Mr. Baker for the care with which these old and quaint papers are preserved. pleasant and entertaining talk by the speaker of the evening, which was supplemented by remarks by several of the old soldiers and others. October 30. "The Purposes of History Study," by David Snedden, Ph.D., Massachusetts Commission of Education. Your president was away from home on his golden honeymoon trip on this occasion, and again Mr. Comstock presided. The paper is described as a most scholarly address, and was listened to by several of the school teachers, who were specially invited. The meeting was one of the largest gatherings of the year. November 21. "The Bellingham-Cary House and its Restoration," by Mr. Vernon A. Field of Chelsea. This was an exceedingly interesting talk, descriptive of this ancient house, which stands in what is now the city of Chelsea, and its former distinguished occupants and the efforts that have been and are being made for its preservation. Leaflets giving a picture of the house and a short description of the same were distributed at the meeting. December 19. 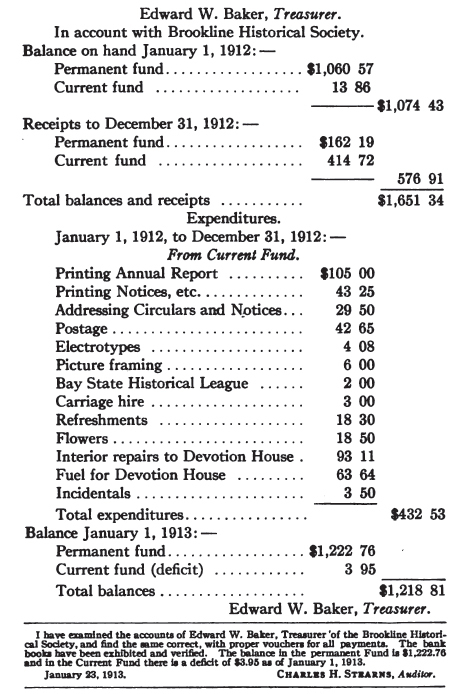 "The Development of Our Commonwealth," by Mr. Charles G. Chick, president of the Bay State Historical League, and also of the Hyde Park Historical Society. Mr. Chick gave us a carefully prepared and interestingly delivered paper on the influences which prompted the settlement of the Plymouth Colony and that of the Massachusetts Bay, and expressed himself most decidedly that Religion was the prominent influence, stronger even than that of Commerce and the hope of gain; and also that the fear of having the English Church established here by the Crown, was the most urgent cause of the Revolutionary war. Six of the above eight papers and talks have been given by persons outside of our own Society, and while they have been of a high order of merit, and attentively listened to, it would seem as if our own members should be more frequently heard here. During the past year, among the many deaths of prominent men in our town, should be mentioned that of Willard Y. Gross, who was probably the best known man in the community, and one most highly respected. Mr. 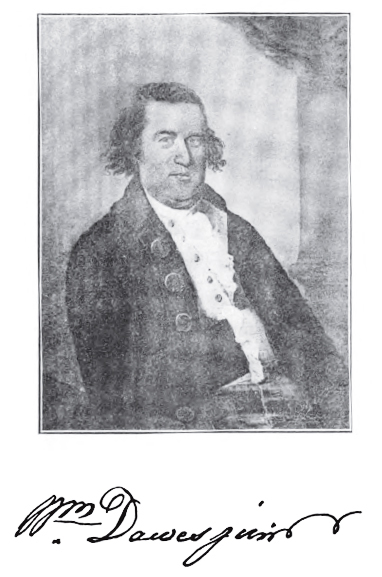 Gross was a native of Duxbury, though his life since early manhood had been spent in Brookline. He was a carpenter by trade, and early in the War of the Rebellion he enlisted and served to the end in the army. Soon after his return, he was appointed janitor of the Town Hall, and as such was best known to the present generation. He was always present at our town meetings and elections, though at the last he had to be carried to and from his home. Mr. Gross was a man of the highest character, and a champion of every good cause, especially that of caring for the old soldier. He was a former member of this Society. Conspicuous among the many changes of this rapidly changing town, during the past year, has been the passing of the Whitney estate at Coolidge Corner. Within less than a twelve-month this home, for nearly fifty years that of the Whitney family, has been taken down. A pleasant green spot, on a wide, dusty thoroughfare, and a beautiful garden, have been eliminated, and a block of stores and offices has been erected, most of which are already occupied. As this family has been prominent in the town, the state and the nation, a few words about the place may be of interest. The house was built in 1857, on land which belonged to the Stearns family. It was first occupied in 1858 by Charles W. Wilder, a dealer in cigars and tobacco. He had quite a large family, two members of which, the wife of Mr. Edgar W. Anthony, and Warren P. Wilder, still live in Brookline. Mr. Wilder was a democrat, and early in the discussions following the election of Lincoln in 1860, was quite pronounced against the Republican government, but after the bombardment of Fort Sumter and when the avowed determination of the Southern Confederacy to destroy the Union was so evident, he became one of the most active citizens in urging the carrying on of the war. Mr. Wilder sold the house in 1863 to Gen. James S. Whitney, another prominent democrat, who had been superintendent of the Springfield Armory under President Buchanan. Mr. Whitney also had a large family, and from his prominence In affairs his home became a center of attraction. He took an active part in our town meetings, and was frequently chosen to serve on important committees. He was a good citizen and a kind neighbor, as your president can testify. General Whitney died in 1879, but the mantle of the father descended to the elder son, and we of this present age know of the accomplishments of Henry M. Whitney. The building of the present boulevard known as Beacon street, in 1887, which before had been a narrow country road, and the establishment of the electric road through its reservation, will always associate his name with the enormous growth of this part of the town since that time. 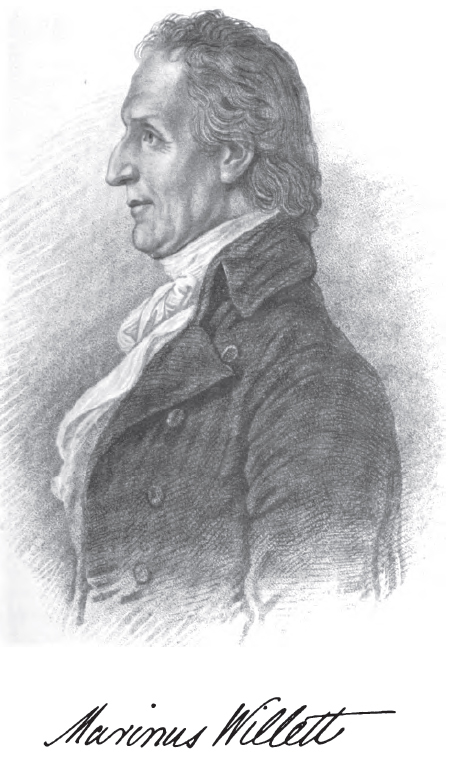 Another distinguished son was William C. Whitney, who was in the Cabinet of President Cleveland. General Whitney's widow lived to be upwards of ninety years of age, dying in 1909. Another home of the past is the house that stood on the corner of Pleasant and Dwight streets. This has been demolished and a block of apartment houses has sprung up from its ruins. This house was built some time in the fifties, and for many years was occupied by William C. Tyler, who was a brother of Gen. John Tyler. One of Mr. Tyler's sons was a teacher in the Adams Academy of Quincy, under the brilliant but rather erratic William Everett. Another familiar landmark, the old brick blacksmith shop on Washington street near Pearl, has been taken down, and a fine block of stores erected by Mr. Harry E. Chase. The thanks of the town should be awarded to Messrs. Chase and Fleming for the great improvements they have made in the village, and which, let us trust, will be an incentive to the owners of the old long house, which in its present condition is a disgrace to the entrance of our town. "The Old Punch Bowl Tavern, which was built previous to 1740 and was demolished about 1839, occupied the northerly side of the street along where the Brookline Village transfer station is now located. All of that part of the town east of the present corner of Pearl street belonged to the town of Roxbury and the district as a whole was distinguished by the name of 'Punch Bowl Village.' 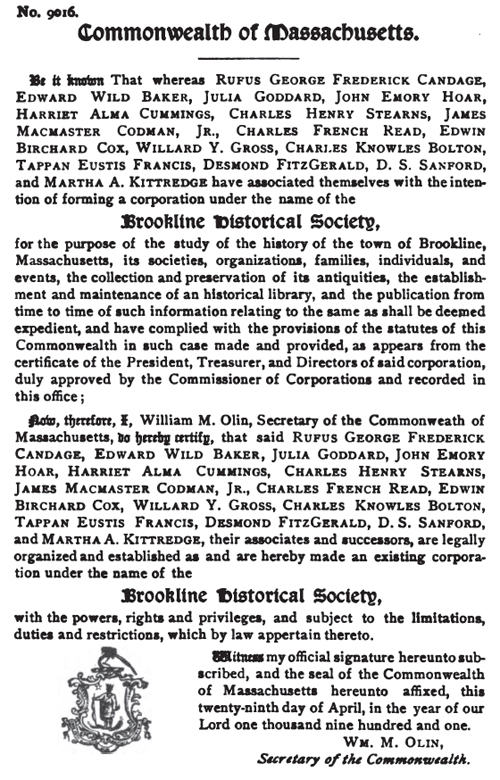 In 1844, by Act of the General Court, this part of Roxbury was annexed to Brookline and the name changed to Brookline Village. When the 'Mill Dam' was built and opened in 1821, the dam proper extended from the foot of Beacon Hill, at Charles street, Boston, and extended to the uplands at Sewall's point. There were two wing dams, one northerly, now the present Commonwealth avenue and Brighton avenue, and one southerly, then called the 'Punch Bowl Road,' now the present Brookline avenue. These dams were constructed so that they provided roadways and were maintained as toll roads until 1868. "Previous to the Revolution the brick blacksmith shop was erected by a Mr. Thomas Brewer, who occupied the old Devotion House which stood next easterly, on the site where now stands Fleming's garage. "In 1819 Lemuel Foster became the owner of this property, and when the recent change in ownership occurred, very interesting original documents were brought to light by his descendants who were the owners by inheritance. "A deed dated April 23, 1788, conveys from Edward Brewer to William Brewer. In 1811 there is a deed to Stephen Sharp, Town Treasurer. In 1818 another deed conveying 'a certain parcel of land with a dwelling house and a blacksmith shop standing on the same, one-quarter acre more or less." This deed not only describes the land by bounds and measurements but has on it a pen and ink sketch of the buildings mentioned. 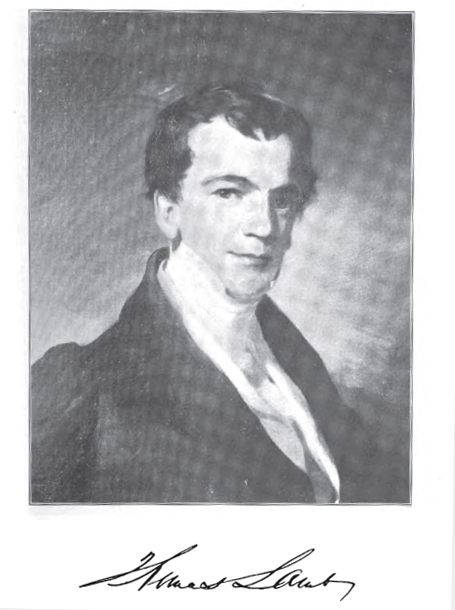 In 1819 Joseph Davenport, administrator estate of William Brewer, by order of the Probate Court, sold a certain parcel of land, with buildings, to Lemuel Foster; and in 1828, Ebenezer Heath, in his capacity as Town Treasurer, sold to Lemuel Foster the property sold in 1811 to his predecessor in office. "The blacksmith shop was continuously used for its original purpose by successive occupants until the property was acquired by Mr. Harry E. Chase. "The corner, where now is the grocery store, was occupied and used as a paint shop for nearly a century. 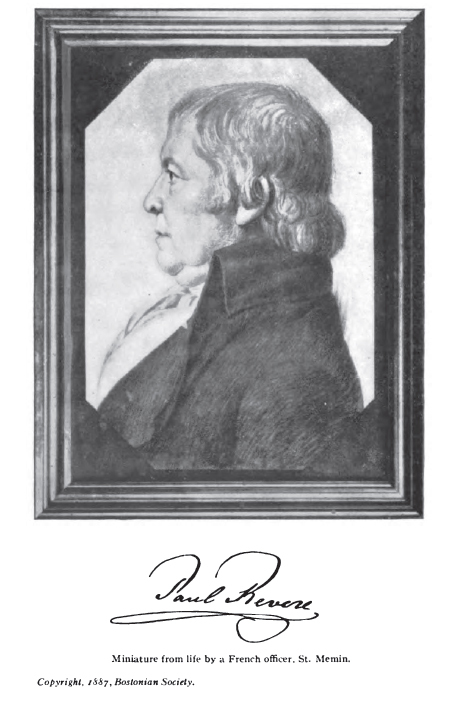 Silas Snow was the occupant and owner in 1813, if not previously. In 1816, the Brookline records show he was paid £12.36 for painting new horse sheds at the meeting house. In 1841, Silas Snow employed a young man who later became the owner of the property and the business. This was the late Benjamin F. Baker, who carried on business in his own name from about 1856 until his death in 1898. The corner property was purchased and developed by its present owners in 1904." During the past year, Boylston street has been widened to a width of eighty feet, necessitating the moving of a number of houses and the taking down of three. As this so-called improvement has not been fully furnished, it is too soon to comment on the need of this great expense. This street was originally laid out as the Worcester turnpike, at a width of four rods, 66 2/3 feet. Another house, which in years gone by occupied a prominent position and was the home of wealth and culture, and which last winter was destroyed by fire, was the Denny house on the top of the hill, (formerly known as Walnut Hill), and which was built and occupied by Francis C. Denny in 1871-72. This house was magnificently located, commanding a most extensive view, with the large farm of 137 acres immediately surrounding the mansion. Mr. Denny came to Brookline from Dorchester in the year 1859 and occupied the house on Newton street at the foot of the hill, known as the Crafts place, now the property of Harry Burley. Mr. Denny moved to the new house in 1872, but lived but a short time after, as he died the same or following year. Mrs. Denny was a daughter of Thomas Groom, the well-known stationer, and she and her family continued to live there a few years, and then the place was sold to Mr. George F. Bouvé, and for a time it was known as the Bouvé farm. Mr. Bouve, who lived on the corner of Kent street and Longwood avenue, owned the farm for a number of years, and it was then sold to a syndicate that built streets and several houses with the hope of attracting buyers of house lots; but largely from its lack of accommodations of transit, a small number of lots were sold, and the place for several past years has been neglected. Indeed the growth of the southerly section of the town has been very small. Much of the land is held in large tracts by families who use the land for their own, and do not care to sell. But in the northerly section, and especially about Coolidge Corner, Pleasant and St. Paul streets, the growth, chiefly of apartment houses, has been phenomenal. 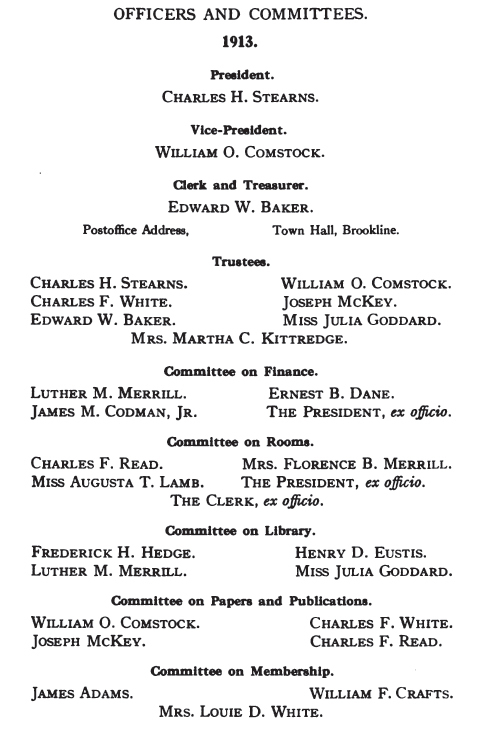 At the town meeting held December 30, an appropriation was made, authorizing the trustees of the Public Library to establish a branch station and reading room at or near Coolidge Corner; and within a few days after, a vacant store in the new Coolidge Corner block, on the former Whitney place, was opened, with chairs and tables provided with magazines and newspapers, besides being a delivery station from the central library. This fills a much desired want in that growing community. As regards our own Edward Devotion House, the home of our Society, we do not know what changes the coming year may bring forth. At the last town meeting, held just at the end of the present year, an appropriation was made looking to the building of another schoolhouse on the town's lot, probably to be located immediately in the rear of this building. What disposition may be made of the old house, we cannot say; but from the money that the town has already put into it for its restoration, and from the large majority, as shown at a former town meeting, against its destruction, it would seem that it should be preserved, if not in its present location, at least on some spot on the large lot in the rear. Our meetings have been well attended and the practice of serving simple refreshments has been continued, which we feel has been conducive to more sociability among those present. Your president would conclude with a hearty "Happy New Year," and with the best wishes for a prosperous one.